The Scottish Government was accused last night of using Brexit as an excuse to pursue its “holy grail” of independence above all else. 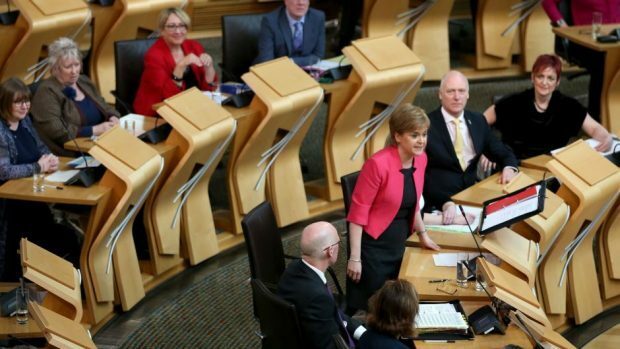 Nicola Sturgeon also faced claims her actions are part of a “well-rehearsed game” as she laid out her case for a second referendum at Holyrood. MSPs will today vote on whether to request a section 30 order from UK ministers – required in order to hold a legally-valid ballot on the constitution. Despite being in minority government, the SNP’s motion is expected to pass with support from the Scottish Greens. The first minister wants to hold a second poll between autumn 2018 and spring 2019, but Prime Minister Theresa May has said “now is not the time”. Ms Sturgeon insisted yesterday that Scotland could not “drift” through the next two years, “crossing our fingers, hoping for the best while fearing the worst”. The SNP leader also said it would be “wrong, unfair and utterly unsustainable” for Westminster to deny Scotland another say if Holyrood backs her call, claiming she has an “unquestionable, democratic mandate”. She added: The UK Government is taking decisions entirely unilaterally that I and many others believe will be deeply damaging to our economy and standing in the world. But Scottish Conservative leader Ruth Davidson said the Scottish people were opposed to another vote. She added: “The SNP’s plans this last week were not actually about trying to hold a fair, legal and decisive referendum. Her Highlands and Islands colleague Donald Cameron said the SNP’s policy on the EU was “incoherent”. He also suggested it had “dawned” on the SNP that their supporters who voted for Brexit might be politically useful. Ms Sturgeon stressed earlier in the debate, however, that her party’s “clear” and “longstanding” position in favour of EU membership remained the same. Scottish Labour leader Kezia Dugdale said independence would “always come first” for the nationalists and called Brexit “just the latest excuse”. Meanwhile, her north-east colleague Jenny Marra warned the Scottish Government’s attention would be “diverted away from people’s priorities” as she said happened in 2014. Scottish Liberal Democrat leader Willie Rennie mocked the insistence prior to the last referendum that it would be a once in a generation event. But SNP Moray MSP Richard Lochhead defended his government’s position, insisting the situation was of Mrs May’s “own making”. He said there was no sign the prime minister had heard a word the Scottish Government had to say.